I'm excited to announce that the store page is finally open, where show tickets, merchandise and any random stuff are either being sold, or given away for free. Everybody loves free stuff. 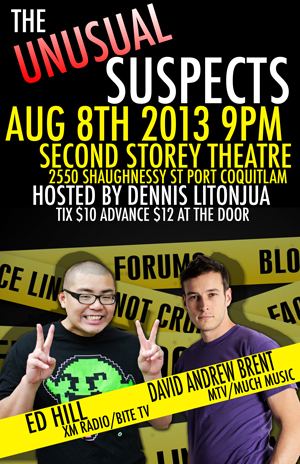 This being said, tickets for "The Unusual Suspects" on Aug 8th at Second Storey Theatre are on sale now at the store for $10 advance. They are $12 at the door so make sure you grab them before hand. Show time is 9PM, hosted by Dennis Litonjua and we also have a surprise guest. Also, David Andrew Brent is a phenomenal impressionist.